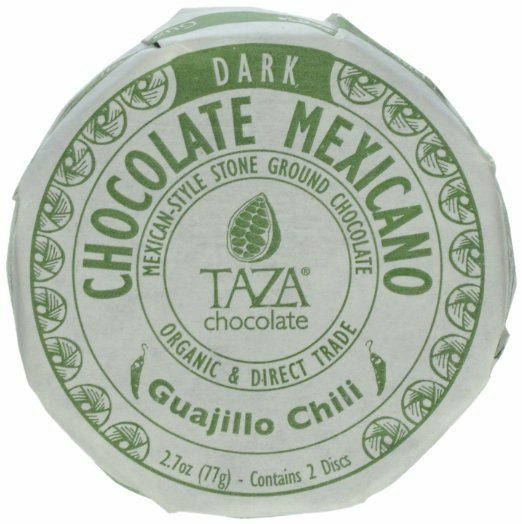 Taza Chocolate Mexicano Chocolate Disc, Guajillo Chili, 2.7 Ounce Just $6.38! You are here: Home / Great Deals / Amazon Deals / Taza Chocolate Mexicano Chocolate Disc, Guajillo Chili, 2.7 Ounce Just $6.38! If you haven’t tried spicy Mexican chocolate you are really missing out on something special! Head over to Amazon to order a Taza Chocolate Mexicano Chocolate Disc, Guajillo Chili, 2.7 Ounce Just $6.38! Shipping is FREE for Prime members or on orders of $35+. Additional flavors available! Chilies are often added to chocolate in Mexico for a spicy kick. We grind single-origin Dominican cacao using vintage Oaxaca stone mills to preserve its complex flavor and rustic texture, then blend in organic chilies. The result is a bright, bold chocolate that perfectly balances sweet with heat. 50% dark chocolate. Ingredients: organic cacao beans, organic cane sugar, and organic guajillo chili powder. May contain traces of tree nuts and/or peanuts.